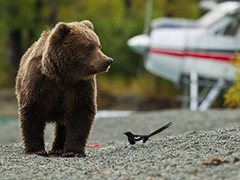 Our flightseeing and bear viewing tours throughout Lake Clark National Park are designed for small groups and provide you with a personalized experience. The activities take you into Alaska's most remote areas for chances to photograph bears, caribou, eagles, tundra, glaciers, waterfalls, mountains, and much more. The floatplane and guides are with you for the day, giving you the flexibility to move about and explore the best of the remote Alaska backcountry. 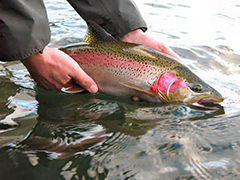 Our catch and release packages help to maintain the same productive fishing we have seen for generations. These tours truly take you away from the crowd and into Alaska the way it is. 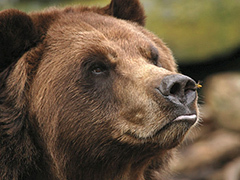 In May and June, Alaska’s amazing coastal brown bears are just waking up and this is the place to see them. Chinitna Bay, on the southern edge of Lake Clark National Park, is where bears roll out of their dens, graze on sedge grass, mate, and teach their cubs how to dig for clams in May and June. The guides at Bear Mountain Lodge, on the shores of Chinitna Bay, will take you along the beaches and into the meadows where you can view and photograph bears and enjoy the tranquil setting. This trip includes a scenic flight past mountains, glaciers, volcanoes and wildlife. One meal at the lodge is included– either lunch or dinner. Trips are booked around low tide (which is optimal for bear viewing) and are about 6 hours long with 4 hours on the ground at Lake Clark National Park. During August and September, our passengers enjoy a guided bear viewing experience at Redoubt Mountain Lodge in Lake Clark National Park, where the lodge’s experienced bear guides provide access to stunning bear viewing via a pontoon lake cruise. Crescent Lake, the location of the lodge, is beautifully set amidst mountains in Lake Clark National Park. Bears fish and play along the shores of the lake. A unique aspect of this trip is the opportunity to view the bears from the boat, you can get very close to the bears as they are fishing in the lake. After your bear viewing cruise, you’ll enjoy a gourmet lunch at the lodge before your flight back to Homer. We also offer bear viewing day trips to Redoubt Bay Lodge, on Big River Lakes at the mouth of the famous Lake Clark Pass. Our guided full-day fishing trip to Redoubt Mountain Lodge is available from June through September. Multiple species are available for anglers depending on the time of year and it is common to take home a number of freshly caught salmon. Fishing is with experienced guides both from boats in the Crescent River and along the shore of the lake. Take a mid-day break and enjoy a lunch at the lodge while taking in the spectacular scenery around you. This trip includes: floatplane transport, fishing guide, boat with driver, fishing gear (rods, reel and tackle), cleaning, filleting & vacuum sealing of salmon, a gourmet lodge lunch along with snacks and drinks to keep you fueled throughout the day. 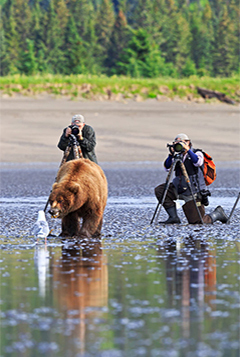 Hiking, photography and bear/wildlife viewing available..
Alaska Bear Viewing at Silver Salmon Creek is the ultimate bear viewing experience. Silver Salmon Creek is located on the western shores of the Cook Inlet, in the pristine Lake Clark National Park and preserve. This ocean front setting is the ultimate bear habitat. As you can tell by the name of the area, the creek running through the middle of the prairie land is loaded with Silver Salmon, attracting a resident Brown Bear population to the area all summer long. The tall grass and a backdrop of the Iliamna Volcano make for the best pictures. Silver Salmon Creek Bear ViewingYour Silver Salmon Creek Bear Viewing Adventure Begins when you depart Anchorage on one of our aircraft and head south along the Cook Inlet. The flight in itself will be a highlight of your trip; this scenic route takes you by 3 active volcanoes, numerous salmon streams, glaciers, and other Alaskan sights. The flight down takes about 1 hour, once there the aircraft will land on the beach of Silver Salmon Creek at low tide. Your naturalist bear guide will meet the plane on the beach and bring you up to the lodge for a bear orientation via 4-wheeler. The Silver Salmon Creek Bear Viewing Begins after a brief bear orientation aimed at group safety. From the lodge you will go out into this ideal bear habitat to watch these creatures interact with each other in the wild. Your guide will take you through the park, adding to your safety and answering any questions you may have about the bears. The area is excellent for viewing the bears because of the layout and geography; it is a 5 miles stretch of prairie grassland beachfront. Watch as they frolic in the grass with their cubs, dig for clams, and take afternoon naps. Silver Salmon Creek is becoming well known as the best bear viewing in Alaska, and for good reason. This area is home mostly to Brown Bears, but it is not uncommon to see a few Black Bears in the area as well. After Bear Viewing head back to the lodge for a hardy homemade lunch and refreshments. Relax in the comfort of one of the nicest lodges in Alaska for a while before heading back out for the afternoon session with the bears..